Our ear piercing service costs $25 and includes earrings. If not done correctly or professionally even a simple ear piercing could leave you with an infection or blood borne virus. Accessorise your outfit with a stunning pair of earrings. Most women love jewellery, so a pair of matching earrings for a necklace or bracelet can seem like the perfect match. Unless you have your ears pierced though, you’re stuck with clip on earrings. Earrings are a timeless fashion item. They’ve been around for almost as long as civilisation itself and are sure to be around for a long time to come. 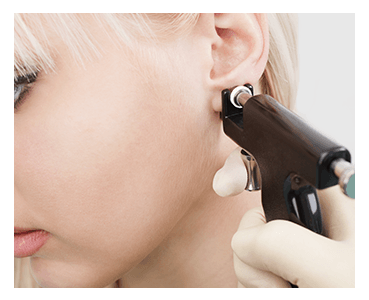 We offer a hygienic and professional ear piercing service using a sterile surgical steel ear piercing gun. We can pierce the lobe or cartilage part of your ear. Our ear-piercing procedure is safe and suitable for men, women, and children and the earrings we use are hypoallergenic. We’ll use a surgical marker pen to mark the exact location where you wish your ears to be pierced. Before piercing we clean and disinfect your ear with pre-sealed alcohol swabs and sterile and disposable holders. A piercing can take up to one year to heal completely so that the hole doesn’t close up permanently if you take your earrings out. 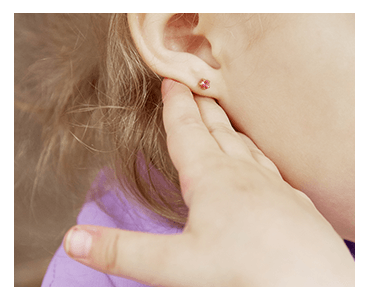 Typically, it takes around 6 weeks for an ear lobe piercing to heal and around 12 weeks for an ear cartilage piercing to heal. Visit our beauty salon on the Gold Coast and we’ll make sure you get a professional, safe, and hygienic ear piercing in a relaxed setting. Along with ear piercing we can take care of your other beauty needs such as customised nail art, waxing, and facials. We offer a professional and personal service at affordable prices. We are open We are open Tuesday and Wednesday 9:00am to 5:00pm, Thursday and Friday 9:00am to 6:00pm and Saturday 8:00am to 1:00pm.